It’s a jungle out there. There are so many pet food companies clamouring for our attention. They want us to believe that their products contain 100% of the nutrients your dog or cat needs to support a healthy, active and long life. At the same time, their products need to be cheap. People inform their purchase decision by looking at the price-tag on the shelves. If Company X has 100% nutrition for $29.99 and Company Y has 100% nutrition for $19.99, a choice is often made based on price alone. These companies produce unbelievable amounts of product on a daily basis and they must do whatever is necessary to cut costs. Once that is done, they must justify the cost cutting to the public. To be more accurate, they must deceive the customer by hiding the true nature of their products. In general, companies attempt to increase the appearance of high quality meat proteins in their food blends. 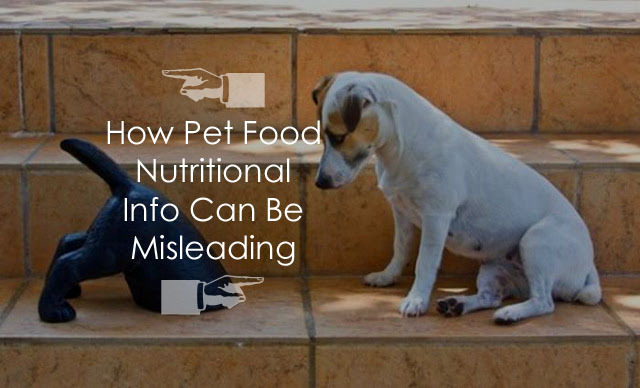 Let’s look at a few ways that pet food companies mislead, re-direct and gloss over the nutrition in their products. What does a pet food company do when they want to rearrange the order of ingredients on their labels? As an example, let’s say that corn is the top ingredient but they want to have their protein ingredient (some form of meat or meat meal) at the top. They simple sub-divide the corn so that it nicely fits under, not above the protein. And just like that, the chicken meal is at the top of the list. At a cursory glance, it seems that our pet is getting a quality chicken-based product but in fact there are a whole lot of unnecessary, low quality carbs making up a significant portion of the blend. This trick enables the marketing departments to say things like, “Made from real chicken” as a primary point of quality. The takeaway is to not put too much importance on the top ingredient in a list. This may not accurately represent the truth of the matter. In dry pet foods, raw meat is either cooked or dehydrated to be used as an ingredient. Diminishment of nutrition aside, the problem is that some companies weigh the meat in its raw form and use that number to put the meat at the top of the ingredient list. Raw meat, with its moisture and fat content, is quite heavy but once the meat is cooked or dehydrated, it would naturally drop way down on the list of ingredients, being cheap corn, rice and grains. Now we understand that the beef at the top of the list was weighed before the dehydration process, when it was much heavier. They promote, “Real beef as the #1 ingredient” when in fact the corn, barley, rice, wheat, etc., is much more prominent. The point to understand is that lower quality pet foods have much less meat than you are led to believe. Better brands will have a few specific meat or meat meal items at the top of their ingredient list. A side note is that, the #2 marketing point of this product is, “Accents of real spinach, peas, and carrots”. These ingredients, added in dehydrated form, appear starting at #20 on the lengthy ingredient list! As you can see in the above example, chicken by-products, and other meat by-products are commonly on ingredient lists. This refers to various and sundry parts of the feed animal that are not meat. The meat by-products are what is left over after feed animal processing for human consumption. The good bits go to the meat department in our local grocery store and what’s left behind is now labeled a by-product. In addition to the animal parts named above, one may also find beaks, feet and feathers in a vat of by-products. Rice, Brewers Rice: No nutritional value. Brewers rice is a cheaper rice processed rice product with even less nutrition than regular rice. Meat By-Products: We previously discussed by-products. How about by-products from an unknown source, perhaps roadkill, euthanized pets or horses? Sad but sometimes true. Animal Fat: Fat from what animal?? The ingredients mentioned here are common and inexpensive components of the “100% nutritionally complete and balanced” food that is produced by many pet food companies. To add insult to injury, federal regulations do not prohibit this type of misleading labeling practice. This type of marketing and labeling is used to gloss over or misdirect attention from what is really in a bag of pet food. And these are just a few of the tricks. So, it is up to us to learn more about what is healthy for our pets, how to decipher food labeling and whenever possible, opt for quality food over cheap, mass produced, nutritionally incomplete product.